It's all about the sound. That, at least, is what we are constantly told by the publicity machine that whirs smoothly around the Berlin Philharmonic, one of Germany's great cultural institutions. And this concert was even preceded by a talk, which unfortunately I was unable to attend, in which one of the Berlin Philharmonic's players discussed that sound. There's maybe something a little dangerous about this emphasis, however, and such rhetoric runs the risk of characterizing a great orchestra as little more than The Ultimate Orchestral Machine, to adjust a slogan from another German export: smooth, powerful, sumptuous. There is a suggestion, already voiced in some quarters during the Berlin Philharmonic's joint residency at the Barbican and the Royal Festival Hall, that Sir Simon Rattle, too, is perhaps a little in thrall to the sheer technical brilliance of his players. It's difficult to blame him, but, as was the case here, he can seem bewildered at the number of interpretative possibilities such technical security offers him. And in this performance of Mahler's Third Symphony, a work so rooted in nature, there was simply too little sense of the organic. Rattle's predecessor, Claudio Abbado, brought the same work to the Festival Hall with the Berlin Philharmonic Orchestra in late 1999. That performance, released on CD by Deutsche Grammophon, gives an idea of what was missing. The evening started promisingly, however. First, Rattle had made the unusual, but welcome decision to include a pair well-chosen of appetisers. Brahms's sweetly sentimental 'Es tönt ein voller Harfenklang' featured some glorious playing from principal horn, Stefan Dohr, and soprano Anke Hermann made a decent stab of communicating the delicate mischief of Wolf's three-minute 'Elfenlied' across the Festival Hall's vast space. The Mahler began with a reassuring sense of purpose, and the mad, swirling ambition of the enormous opening movement brought out the best in Rattle and his players. Technically, of course, it was a marvel, but the movement's scale—in terms of its kaleidoscopic emotional spectrum, variety of musical idiom, as well as sheer duration—forced the conductor to seek formal coherence deep below the surface. That surface, of course, did teem with the most wonderful detail (the lightness of those trilling string textures, for example, or the magnificent solos from the principal trombone), but there was also a powerful sense of the elements unleashed, a palpable sense of sublime nature threatening to overcome. The rustic simplicity of the second and third movements is very different, and was less successfully communicated. The Tempo di menuetto was overburdened with too much sophistication for its own sake. Much of it struck me as too fast, while the rallentandos were pedantically micromanaged: one, half way through, saw all sense of momentum allowed to seep out. The breathtaking delicacy of the divisi strings at the movements close almost made up for it, but not quite. Rattle seemed more relaxed in the Comodo, but some of the same quirks persisted, even if Tamás Valenczei's beautiful posthorn solo melted the heart. The contralto Nathalie Stutzmann was magnificent in symphony's angst-ridden core, Zarathustra's Midnight Song. There can be few voices better suited to this movement, and the mysterious strains of her lament, shrouded in pianissimos from the strings and answered by bizarre, alienating Naturlaute in the winds, were disturbing and moving in equal measure. She was, predictably perhaps, less suited to the sunny fifth movement, surrounded by lusty trebles (Choir of Eltham College) and ladies (assembled from the London Symphony Chorus and BBC Singers). Launching, as Mahler requests, attaca into the radiant finale, Rattle coaxed some breathtakingly beautiful playing from his strings. Setting a tempo more flowing than some, the signs were promising. As the movement progressed, however, the sense of inexorable, inevitable growth was missing. Tempo shifts were noticeable where they should have been organic and imperceptible; details of the score were underlined (an accented second violin counterpoint early on stuck out far more than it should have). While the brass chorale towards the end was marred, admittedly, by a fluffed top line (a slavish adherence to the extremes of Mahler's dynamic markings finally proving a player's undoing), it also seemed too fast. 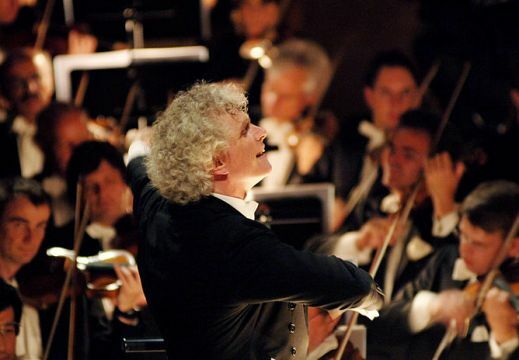 Finally, and although it should perhaps be irrelevant, Rattle's conducting of the final bars came across as more a performance of the Great Conductor's art than anything else. After one last magnificent crescendo, as the orchestra went hell for leather, timpani bim-bamming with all their might, Rattle became almost still, turned to his right as if waiting for the fifth movement's angels to return and effect his apotheosis. It was a strange end to a performance, magnificent in so many ways, that showed that the Rattle/BPO partnership is still not quite what it should be.